One of my favourite safari lodges in Africa is MalaMala Game Reserve in South Africa. Part of the reason is that it is 13,300 hectares (33,000 acres) and has a 19 kilometre (12 miles) unfenced border with the 2 million-hectare Kruger National Park, making the game viewing unsurpassed. While on a morning game drive with a fantastic ranger, Casey Bennett, we came upon several lions doing what lions do best – sleeping. We sat and watched them for a long time. Other rangers came by with their guests, took a few photos and moved on. However, Casey felt we should wait to see if anything happened, and she turned out to be very right. After about 30 minutes we heard a group of buffalo walking through the bush. The lionesses immediately sat up and we could see them sniffing the air. After some moments, one of the lionesses moved to the back of the buffalo herd and another moved toward the front. Casey repositioned our vehicle so we could watch as the lioness placed at the back of the herd isolated a limping female buffalo. 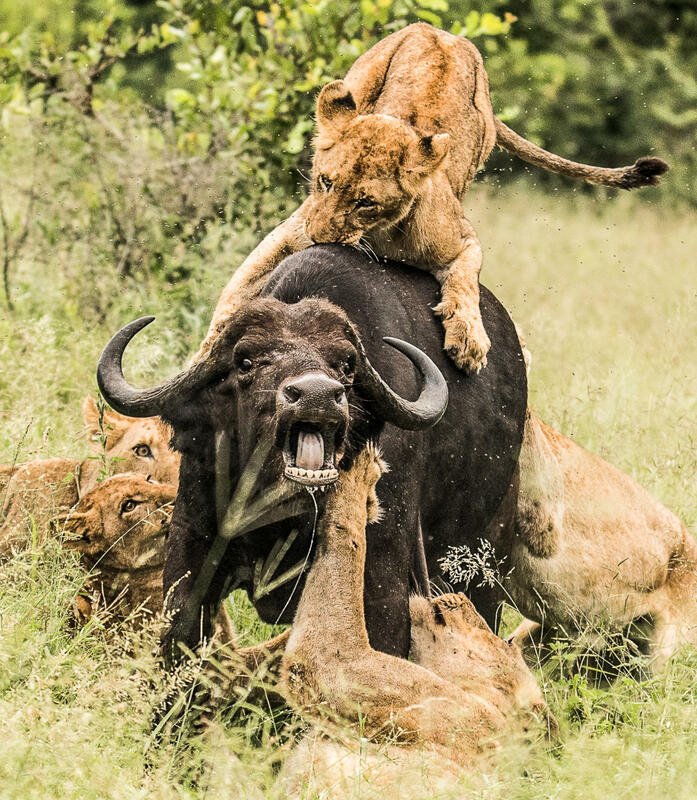 By chasing the buffalo, it ran right into the lioness at the front. For the next 15 minutes, the lionesses worked together to bring down the buffalo while their five cubs looked on. The image you see is not long before the buffalo was too weak to stand and was brought down. The lionesses finished the kill and they and the cubs began to feed. The Masai Mara is one of my favourite locations in Africa and one I keep returning to again and again. It is home to some of Africa’s most iconic wildlife species, competing for survival in a harsh but spectacular environment. Each day in the Mara is unpredictable and every wildlife sighting I am lucky enough to see creates a hunger in me for more. In the day, I’m always searching for better light, more action and different animals. But as the end of the day approaches, I often find myself searching for simplicity: a single subject in a simple moment. This photograph was the result of such a search during one of my visits to Olare Motorogi Conservancy. The conservancies offer some of the best local guides on the continent. Local Masai have not only grown up on the land but are familiar with both the wildlife behaviour and the objectives of visiting photographers. They saw the giraffe on the horizon before I did. 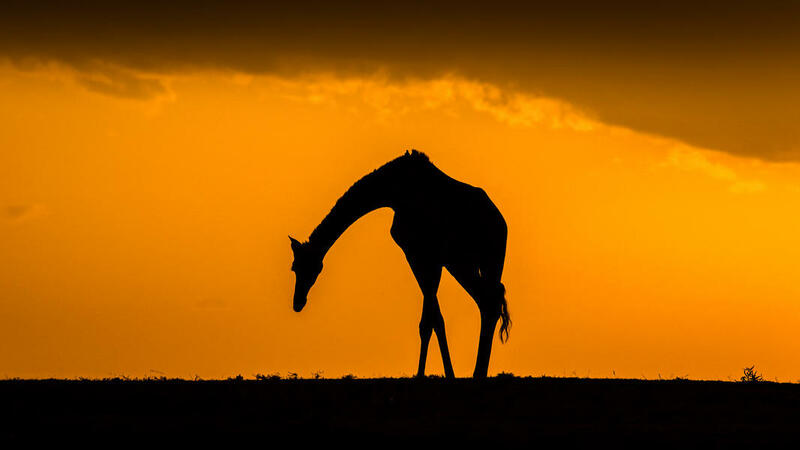 The vibrant orange sunset provided the perfect backdrop for a silhouette of one of Africa’s most iconic animals. Silhouettes are far from original – especially on African safaris – and yet I still find myself looking for opportunities to shoot them as soon as the sun starts to set on every drive. The key ingredients to a shot like this are a vibrant sunset, a clear horizon and an iconic subject. The rest is relatively simple, especially as shooting into the sun provides enough light for a fast shutter speed, despite being later in the day. While I was in Nairobi, Kenya, on business, I took the opportunity to plan a short impromptu trip to the Masai Mara for a quick two-day safari before heading home. Despite it being the low season and not the best time to be on safari, I couldn’t pass up the opportunity to see the wildlife of the Mara. During my trip I saw many different animals including a few groups of lions, some eating fresh kills but most resting in shady areas. The whole encounter seemed to be over before it started with the mating pair moving off into the brush, but long enough for me to capture the photograph I called ‘Wild Aggression’. To get the shot I was using the Canon 5D Mark III with the Sigma 150-600mm Contemporary lens extended to 600mm. I wanted to keep my shutter speed high to ensure a sharp picture and used the widest aperture I could with the lens (f/5.6) and an ISO of 400. For post-processing, I used Lightroom for some basic adjustments then Silver Efex Pro for the conversion to black & white. 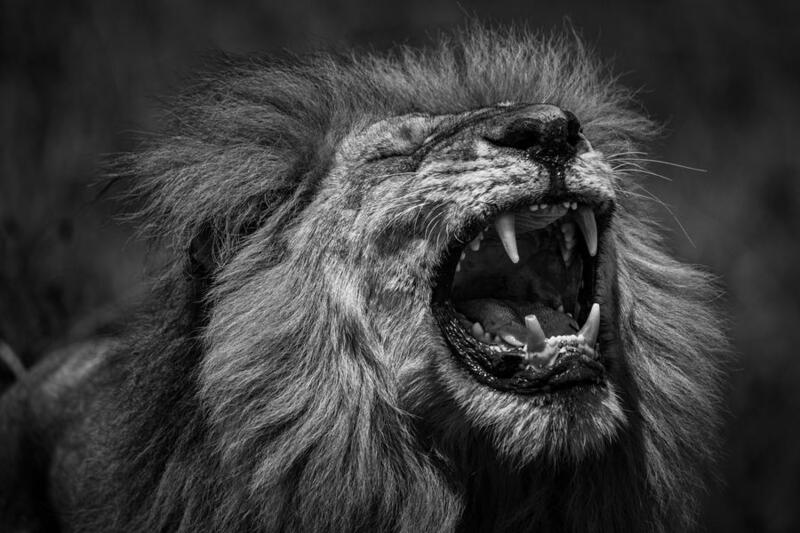 Overall, I was extremely happy with the shot and I felt the conversion to monochrome helped keep the focus on the lion’s face and the emotion he was portraying.